The European Commission and the Fundació Mies van der Rohe announced that the Norwegian National Opera & Ballet, Oslo, Norway by Snøhetta is the winner of the European Union Prize for Contemporary Architecture  Mies van der Rohe Award 2009. The Jury also awarded the Emerging Architect Special Mention to STUDIO UP for Gymnasium 46° 09 N / 16° 50 E, Koprivnica, Croatia. 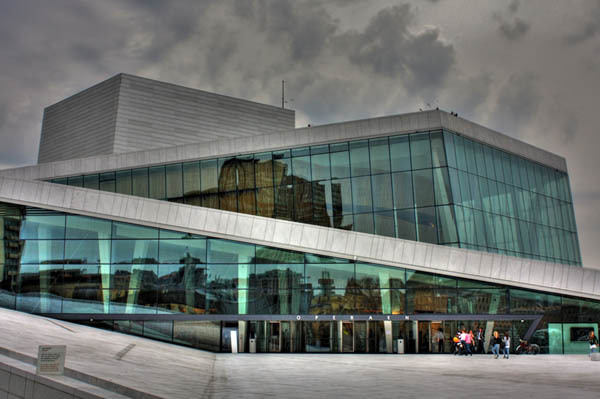 According to the jury, the the Norwegian National Opera & Ballet is a landmark building by Snøhetta. It's the largest cultural centre built in Norway in 700 years. It sloping stone roof – made up of 36,000 fitted pieces  rises up from the fjord; allowing members of the public, residents and opera goers alike, to walk over the building, developing a relationship with the public structure. Integral to the 1,000-room interior, which is largely lined with crafted woodwork (using the traditions of Norwegian boat builders), are a number of art commissions interwoven into the structural fabric, including a cloakroom, a collaboration with their 2007 Serpentine Pavilion collaborator Olafur Eliasson. The Gymnasium 46° 09 N / 16° 50 has a mixed-use programme which includes a sports hall as well as a high school. The spatial and visual overlapping of the facilities was the basis of the design concept and the spacious interior street organises and connects all the programmatic elements. A system of shutters above the sports hall and the ducts through the cantilevered classrooms of the top floor ensure a constant flow of cool air during the summer months while the double polycarbonate skin creates a green house effect in winter. The building transforms the suburban periphery of Koprivnica by creating a landmark and an emblematic place for the young people of the town. The European Union Prize for Contemporary Architecture  Mies van der Rohe Award 2009 is funded with support by the European Union and one of the most important and prestigious prizes for international architecture. It is awarded biennially to built works completed within the previous two years. By supporting the prize, the European Commission underlines the role of architecture as a driver for creativity and innovation, opens up culture to audiences beyond national borders and draws attention to the European professionals contribution in the development of new ideas and technologies that impact Europeans everyday life. The finalists were selected from 340 projects proposed by the Architects Council of Europe (ACE) member associations, other national architectural associations, the group of Experts and the Advisory Committee. The Jury, chaired by Francis Rambert includes: Ole Bouman, Irena Fialová, Fulvio Irace, Luis M. Mansilla, Carme Pinós and Vasa J. Perovic.